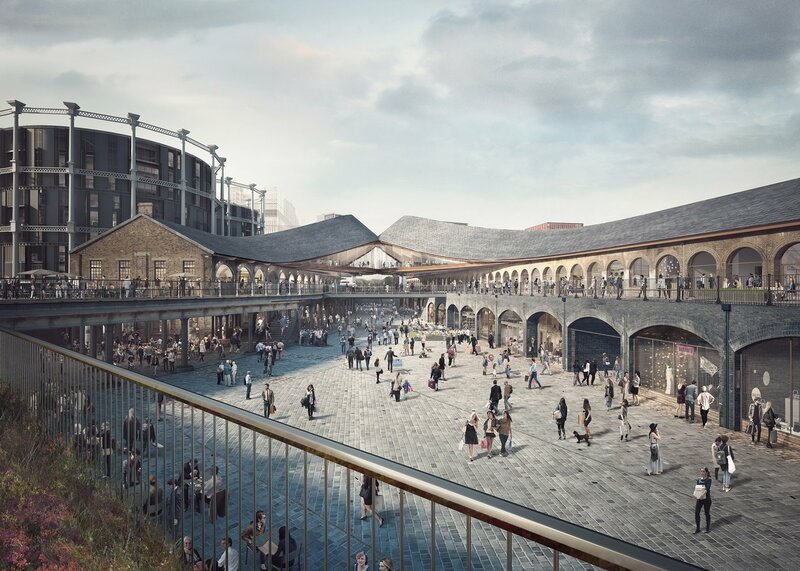 Designer Thomas Heatherwick has won planning permission to convert a Victorian coal yard in London's King's Cross into a canal-side shopping destination. Located next to Regent's Canal, Coal Drops Yard will include approximately 65 shops, including five large stores as well as restaurants, galleries, music venues and a new public square. The London-based Heatherwick Studio will renovate two existing buildings next door to the Central Saint Martins school campus, which were built in 1850 and used for storing coal arriving from the north of England. But the designer also plans to adapt the pair of structures so that their traditional gabled roofs will curve up towards each other and meet. "These two historic structures were never originally designed for people to circulate through and by themselves would have never made a successful retail destination if we did nothing more than clean them and fill them with shops," said Heatherwick. "The distance between them being too great to have any social chemistry with each other and only two stories of activity would not create enough busy-ness and vitality." "So rather than adding an entirely foreign new structure to connect the old buildings, we chose simply to bend and stitch the two roofs together, forming another level of activity underneath, and framing and weather-protecting a dynamic new public space for the city," he added. The 9,300-square-metre project was commissioned by property developer Argent and is being led by King's Cross Central Limited Partnership (KCCLP), which is overseeing the wider redevelopment of the area. "Coal Drops Yard has been designed to be a shopping experience unlike any other," said Morwenna Hall, senior projects director for Argent. "The design by Heatherwick Studio is a considered response to the important Victorian industrial buildings from the 1850s; in fact, the ability for future visitors to the Coal Drops Yard to appreciate the history and various functions of these buildings has been fundamental to the design process." Heatherwick Studio is also believed to be working on the latest designs for Google's new London headquarters, which is part of the same development. Camden Council granted planning permission for Coal Drops Yard in a meeting last night. Construction is due to start in early 2016 and complete in autumn 2018. A teaser image of the proposal was revealed by the studio in October, showing the original cobbled streets and brick arches accompanied by a new bridge link. The latest pictures reveal more details about the bended roof design. Heatherwick is currently working on several other architecture projects, including a plant-covered Maggie's Centre and the controversial Garden Bridge. He is one of several designers to make the jump to architecture, with others including Dror Benshtrit and Maarten Baas. Top image is by Forbes Massie.